There are various ways that you can help your site be found and increase its relevancy in Google and other searches (including the University site-wide search). Fill in the boxes for Site description and Site keywords - make the description as pithy as possible to hook searches for phrases that people may search for. This may take a bit of thinking about. Save the page before you leave it. Second make sure your teaser home page has some meaningful text on it that can also be indexed. First register with Google analytics (http://www.google.com/analytics) and acquire a site code (you will need a Google account - it may be useful for you to start a specific Google account for these analytics so that it isn't tied to you personally and can be passed on if you change role). Fourth, link your site to Google webmaster tools (https://www.google.com/webmasters/tools/home?hl=en) as that will kickstart indexing of your site, give you access to search data, and if need be give you a route to delete URLs from Google's index. To kickstart indexing, go to the site in webmasters tools and click on 'Sitemaps'. All Falcon sites automatically have site maps, for which the URL is /sitemap.xml.gz. Click on 'Add/Test sitemap' and add the URL, then refresh, and indexing for the site will be queued. To check your robots.txt file (see below) go to Crawl > robots.txt tester in the left navigation. 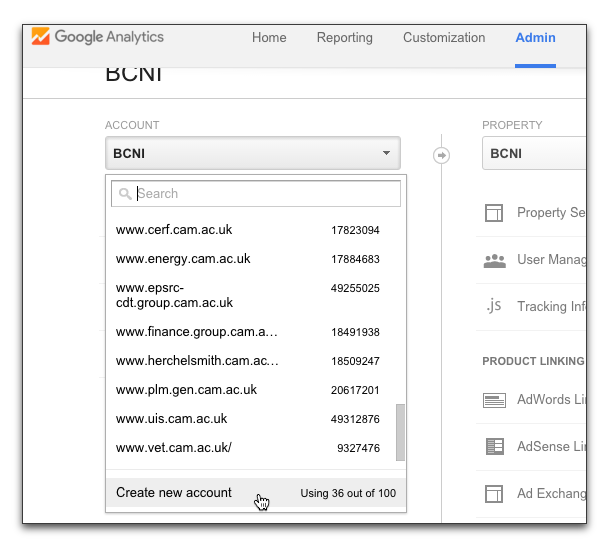 There is a course to introduce you to Google analytics - see http://training.cam.ac.uk/ucs/event/1536732 for upcoming courses. Here is a version of the course handout (which may be superseded in the course you attend). If you want to stop your site (or part of your site) from being indexed refer to 'Stopping some or all of your site from being indexed by search engines', which tells you how to use the robots.txt file to achieve this. If you are migrating your site and have existing Google analytics code, just copy and paste the same code into your Falcon site, and then when the site takes over the analytics will continue without any pause.